When Things Turn Sour, What Can You Do? Car Problems Driving You Crazy? There are more than 250 million cars on the road in the United States, but not all of them are safe – and cases of exploding sunroofs and damaged cars being sold as "accident-free” are prompting complaints from worried consumers. On top of that, we've got news about Uber drivers and auto insurance adjusters who may have been improperly classified and could be owed money – and, of course, the latest settlements and news. Most people don’t ask much of their windshield washer fluid. Does it keep your windshield clean? If so, there’s not much more it can do. Consumers who used Rain-X products, however, are complaining that the wiper fluid is giving them problems and even damaging their cars. 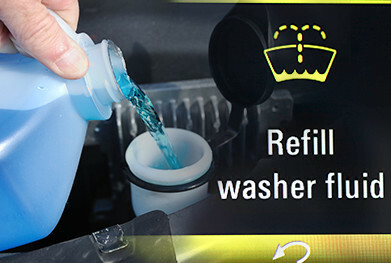 In a class action lawsuit filed in New Jersey, Rain-X users allege that the washer fluid is advertised as suitable for use in all mass-produced cars when it can reportedly cause problems in certain American and European brands like Volkswagen, Mercedes-Benz and Chrysler. So far, it looks like there are two different problems reportedly linked to the washer fluid: inaccurate fluid level readings, including low-fluid warnings even when washer fluid has just been added, and damage to cars’ fluid sensors – a problem that has cost some drivers hundreds of dollars to fix. Consumers are now suing the manufacturers of Rain-X in an attempt to get their money back. Read more. Did you buy a car from CarMax recently? If so, we want to hear about your experience. We’re looking into complaints that the company resold vehicles that had previously been in accidents, all despite claims that the cars were “accident free.” In some cases, consumers claim that the accidents weren’t reported to the DMV and that efforts had been made to hide the damage. Attorneys are now looking into a class action lawsuit against CarMax, so if this happened to you, get in touch with us today. It may still be summer (just), but people across the country are getting cold feet – by stepping in water that’s leaked from their freezers. Attorneys are investigating reports that several brands of bottom-freezer refrigerators, including Whirlpool, KitchenAid, Kenmore and Maytag, may contain a defective tube that easily clogs and causes the appliances to leak. Because the freezers are bottom-mounted, water can leak onto the floor, potentially causing damage far beyond the fridges themselves. No lawsuit’s been filed yet, but consumers who’ve had this problem may be able to get one started. Learn more. What’s something people associate with sunroofs? Road trips? Summer days? If you said “explosions,” you shouldn’t be right – but you are. Attorneys working with ClassAction.org are now investigating instances of panoramic sunroofs spontaneously exploding in cars across the country. The problem doesn’t seem to be limited to any make or model and hundreds of complaints have already been reported to the National Highway Traffic and Safety Administration. Learn more. State Farm Investment is being sued for allegedly charging “excessive” management fees to customers who invested in the company’s target date mutual funds, known as LifePath funds. These fees may have significantly decreased investors’ returns over time, according to the suit. The lawsuit claims that the practice violates a federal law known as the Investment Company Act of 1940, so if you have a LifePath fund through State Farm, get in touch. Attorneys working with ClassAction.org are looking into allegations that some auto insurance claims adjusters – specifically those using Colossus and ClaimIQ software – are being misclassified as “exempt” from overtime pay and not getting wages they’re legally entitled to. To help with their investigation, ClassAction.org is asking to hear from current and former insurance adjusters so the attorneys can learn more about their job duties and how they’re getting paid. Adjusters who use these programs without getting paid overtime for their 40-plus hour workweeks may be able to take legal action. Learn more. Having acceleration problems with your Dodge Ram? If so, ClassAction.org wants to hear from you. Reports from the National Highway Traffic and Safety Administration suggest that a number of Dodge Ram owners have experienced sluggish and/or unintended acceleration in their vehicles. Attorneys are now investigating whether a lawsuit can be filed over the issue. Learn more. Fitbit, Inc. is facing a lawsuit from disgruntled customers who paid a premium price for fitness trackers that were supposed to track their sleeping habits. The catch? The devices – which were sold with packaging that clearly advertised the feature – may not be able to track users’ sleep accurately. In fact, according to a study quoted in a recent lawsuit, tracking anyone’s sleep habits without the use of electrodes gets a bit tricky. It’s good to stay well rested, but electrodes may be going a bit far. Consumers are seeking compensation for what they say constitutes false advertising. California Uber drivers won an impressive victory this week when they convinced a court to certify them as a class in a lawsuit over the company’s handling of tips. Drivers claim that Uber cheated them out of gratuities by inaccurately labeling them as contractors, and while the company strongly disagrees, it seems to have dug its own grave on this one: by arguing that certification should be denied because drivers each have a unique relationship with the company, Uber managed to convince the judge that, since there was so much variation, Uber may be wrong in classifying all drivers as contractors. Confusing? Maybe, but the point is this: the lawsuit will now continue, with the drivers seeking compensation for tips they say they never received.